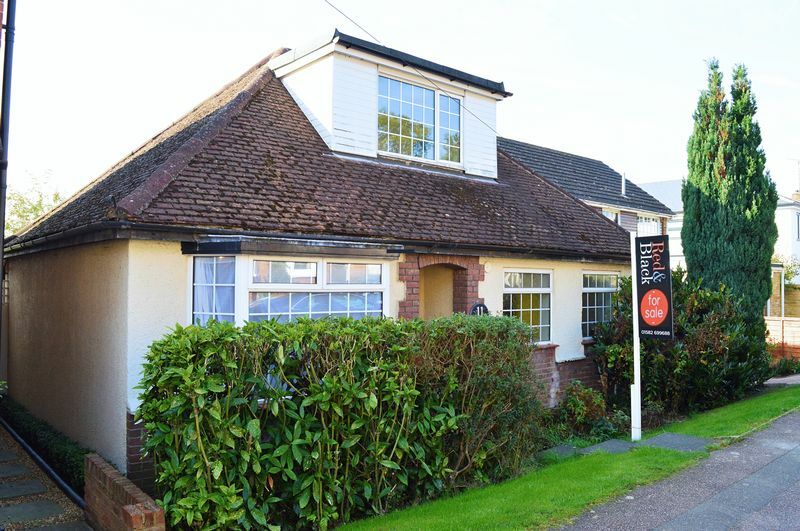 Red & Black are delighted to be able to offer for sale this spacious three bedroom detached chalet bungalow in the much favoured location of Batford. The plot is situated in the highly sought area of Batford, Harpenden. Located just minutes from Harpenden mainline train station offering direct routes into London, and with the M1 just 8 minutes away, this home will be a perfect location for commuters. The ground floor of the property currently offers the master bedroom, as well as the family bathroom, kitchen, lounge, study and conservatory. Located upon the upper floor are the remaining 2 bedroom, with one offers a walk in wardrobe space. This home benefits from both a garage and a 3 car driveway, as well as mature and well maintained gardens to both the front and the rear. The property requires modernisation throughout offering the chance for the new owner to create their dream home. The area has a selection of excellent schools to choose from for all age groups. This property also offers full planning permission for a new build 3 bedroom (Approx 2000 SQ FT) detached family home to be erected in place of the current dwelling. See St Albans Council Portal for the full planning with reference; 5/2015/0965. Further details and drawings are available upon request for the new property.